The use of ultra intense laser pulses to excite plasma waves with a relativistic phase velocity is a possible route to the development of compact particle accelerators. Quasi-monoenergetic electron beams with energies from 0.1 to 1 GeV have been reliably generated [1,2]. In addition, these compact particle accelerators are sources of intense X-rays with peak brilliances comparable to ‘3rd generation’ synchrotrons . The electrons in the laser driven wakefield do not only experience a strong accelerating field but also a strong focusing field, forcing them to oscillate transversally in so called ‘betatron orbits’ . The pulse is perfectly synchronized with the driving laser pulse; the duration of the generated X-rays is of the same order as its pulse duration . These unique properties offer the opportunity to investigate ultrafast processes in solids or warm dense matter using femtosecond X-ray diffraction or time-resolved absorption spectroscopy (NEXAFS / EXAFS). X-ray sources of this type are based on the betatron oscillation of a relativistic electron in a laser-produced plasma wave. Large numbers of these electrons are bunched together by the interaction with the driving field. Electrons inside each bunch are accelerated longitudinally with the propagating pulse. Additionally they experience the transverse electrostatic field within the wave, much as fast electrons experience periodic magnetic forces inside a synchrotron. The transverse acceleration leads to betatron oscillations. The result is a collimated beam of broadband radiation in the X-ray range, which is emitted at femtosecond pulse lengths. The spectrum and maximum achievable photon energy is determined by the laser and gas parameters. As a driving laser, the JETI laser system at the Institute of Optics and Quantum Electronics in Jena is a multistage CPA system, based on a titanium doped sapphire, which emits at 800 nm central wavelength. Pulse energies up to 0.7 J of 30 fs duration were used for these experiments. This corresponds to peak intensities inside the target slightly above 1018 W/cm². The laser is focused into a supersonic Helium gas-jet (Fig. 2). The spectrum of the laser accelerated electrons was measured by deflecting the electrons with a 0.5 T permanent magnet onto lanex screens (not shown in Fig. 2). The emitted X-rays are recorded by a CCD. This scheme allows the researcher to correlate the energy spectrum of the electrons with the energy of emitted photons for single shot experiments. In order to characterize the emitted X-rays a large area backilluminated CCD (iKon-L DO936NMW-BN) was used. Thin filters were placed in front of the CCD to block radiation below 1 keV. The camera was calibrated for single photon event spectroscopy from well-defined classical X-ray sources. The count number of single events is assigned to a characteristic photon energy. 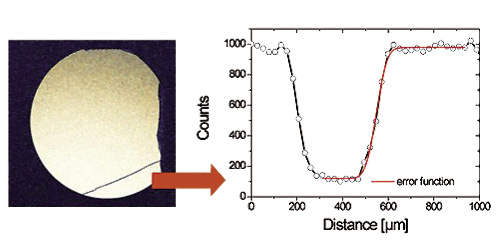 The small pixel size (13.5 x 13.5 μm²) allows reasonable resolution, while the separation of neighboring events is still possible. The spatial resolution and high dynamic range can be useful when determining the spatial geometric properties of the source, e.g. by projecting the shadow image of a wire of known diameter onto the chip. In this way the source was determined to be smaller than 14 μm in diameter. So far, more than 10,000 single shot images have been taken in this setup. From one image a typical X-ray spectrum of the source can be reconstructed. The results are shown in Fig. 4. Photons of energies up to 10 keV, with a maximum in the spectrum around 2 keV. The low energy cutoff is given by the transmission of the used filters. Accounting for the filter function by deconvolution, the results agree reasonably well with simulations. First experiments have successfully demonstrated the generation of broadband betatron radiation with photon energies of several keV. In the future, density shaped plasmas will be investigated to generate X-rays with even higher photon energies. 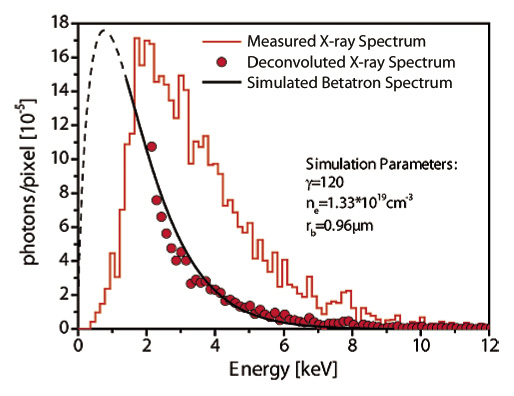 The long term goal is the use of beatron radiation for ultrafast time-resolved absorption spectroscopy. This work is funded as a subproject of the SFB Transregio 18.